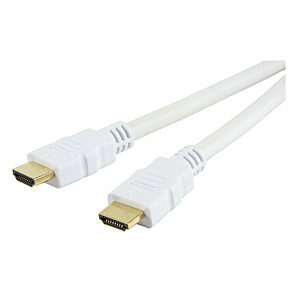 This 15 meter white hdmi to hdmi cable is ideal for connecting your HD equipment to your TV, it will provide perfect picture and sound at a bargain price, our Sharpview Gold range of white HDMI and digital leads produce perfect pictures at discount prices. All cables are RoHS and CE compliant. 20m Long HDMI Cable Active High Speed with Ethernet 4k A high quality long active HDMI cable. Built-in active booster. HDMI High Speed with Ethernet Cable. Individually Screened Cable. HDMI Ethernet Channel. Audio Return Channel. 3D over HDMI. UHD 4k x 2k Resolution Support. Expanded Support for Colour Spaces. Active HDMI cables are directional and must be installed correct way round as per the cable markings.